8 March 2006: The world's population is booming - no more so than in its cities. Today, there are 21 megacities around the world, three-quarters of them in developing nations like India. By 2020, research by City Mayors predicts there will be at least 27 megacities. That staggering rate of urbanization brings its own problems, especially in developing nations, where the majority of the megacities will be found. Mumbai (formerly Bombay) is one of India's megacities and forecast to become the world’s second-largest urban agglomeration. Employment and educational opportunities are the main attraction of urban centers. But hopes for a better life are often dashed as overpopulation puts a huge strain on cities' infrastructures and their ability to provide basic necessities - like clean water and a decent place to live. Many rural migrants who come to Mumbai fail to find adequate work, and therefore cannot afford decent housing. 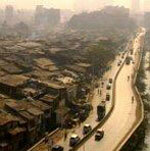 The World Bank says 54 per cent of Mumbai's 15 million residents live in slums. The problem of slums caused by migration is shared by India's other two megacities, Delhi and Calcutta, as well as urban centers throughout the developing world. The problem is pressing, with the United Nations predicting half the world's population is expected to be living in cities by next year. The three fastest growing megacities are Mumbai, India; Tokyo, Japan; and Lagos, Nigeria. India's former chief city planner, Edgar Ribeiro, says Mumbai was doing moderately well by comparison. "Comparing these three, they say that infrastructure is so weak in Lagos and it cannot catch up with the rate of growth, so it's already a disaster," he says. "Tokyo will never face a disaster because it knows how to deal with [it] in its investments in infrastructure and services. Mumbai has learned how to deal with it. It's not good enough. It's not bad enough either. It's somewhere in between." Still, nearly everywhere that there is a spare piece of land in Mumbai, slums emerge along the side of train tracks and highways, and even on sidewalks. Many say addressing land and housing issues should be the city's top priority. Ribeiro disagrees. He says the demands of transport, improved housing for slum residents, environmental protections and other issues must all be addressed in tandem to catch up to residents' needs. "Today the infrastructure in Mumbai would have been wonderful for eight million, but you have 12 million," he explains. "When you start improving it, you will say it's wonderful for 12 million - but it's gone up to 16, and so on. It is catching up - infrastructure. How fast it is catching up, how fast it learns to have integrated growth are the issues." In the meantime, there is a pressing need for basic amenities for slum residents. Darryl D'Monte, an environmental journalist and an advocate for improved urban planning, explains what might help. "If you granted them a lease - not everywhere, but in some places, a lease meaning you have a right to rent your pitch, your space, you pay a rent. Don't forget that's 1.1 million families. You pay rent of 100 or 200 rupees a month - that's enough for the government to provide these basic amenities, which is water, sanitation, lighting," he said. "[And] the big advantage of that alternative is that you'd provide employment within the slum for masons, carpenters." Improving conditions for slum-dwellers is also a matter of public health. In the Mumbai slum of Golibar, a room about 15 square meters is home to a family of eight. Among them is Dewa Ramchandra Bhalerao, 21, who has been fighting tuberculosis for four years. His sister-in-law, who also lived here, recently died of the disease, leaving behind a young son. The family has nowhere to go outside the slum, and Bhalerao says he's afraid he may be infecting the others. He says he is trying to get well, but he can no longer afford the expensive medicine, and his health has declined and he cannot eat well. He says he is really scared since his sister-in-law died. The threat of diseases in crowded cities has taken on a new urgency with the looming threat of a bird flu pandemic. India reported its first ever outbreak in chickens in Maharashtra state, where Mumbai is located. Officials have contained the spread and there are no cases of humans becoming infected for now. "[It's] very difficult to difficult to gauge the magnitude in that case," says Dr. Tushar Rane, who is with UNICEF. "But definitely the magnitude is on the higher side for all the airborne diseases. We have seen tuberculosis or measles - which we see as the major killer of the child. But we haven't seen such an epidemic or such a thing happening in the slum area." Could it be a disaster? "Yes," replies Dr. Rane, "it could be a very big disaster." Like in so many developing nations, Indian authorities are working to improve infrastructure and slum conditions, but resources are limited. Mumbai's population will continue to grow. The question is whether the city - and other megacities like it - can take the strain.